Happy gas, also referred to as “laughing gas,” is made of nitrogen and oxygen. The gas is odourless and colourless and is officially called nitrous oxide (N2O). For patients who have dental phobia, this type of conscious sedation is often used to promote a sense of relaxation, calm and overall well-being. 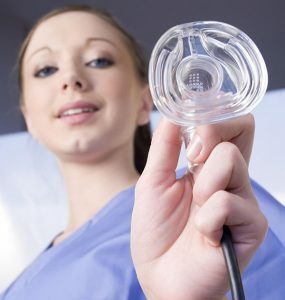 Laughing gas has very minimal side effects and can be used on patients of all ages. The laughing gas is administered by patients breathing in through a mask that’s placed over the nose and is designed to generate a light form of anaesthesia during which the patient becomes less sensitive to pain and anxiety while remaining fully conscious. The calm and relaxing effects of the gas will continue throughout the treatment. Recovery is very quick once administering of the gas ceases and it’s quite safe for the patient to drive within minutes. At Cardiff Dental, we use happy gas to make you comfortable during your treatment. Are You an Ideal Candidate for Happy Gas? Though N2O is a safe sedation option for most dental patients, there are some things that need to be considered before you can undergo this treatment. Regardless of your situation, the dental team at Cardiff Dental is here to assist you in making an informed decision. Don’t put off your dental care because of fear and anxiety. If you are not comfortable with dental appointments and treatments, you can talk with your dentists at Cardiff Dental, and we will be more than happy to make your dental experience as relaxing and stress-free as possible. For more information about our conscious sedation options, contact us today!